Cook with confidence when using this T-fal Tri-Ply stainless-steel multi-clad cookware. Durably constructed, the cookware features a thick aluminum core bonded between two layers of stainless steel for fast, even heat distribution and optimal cooking results. 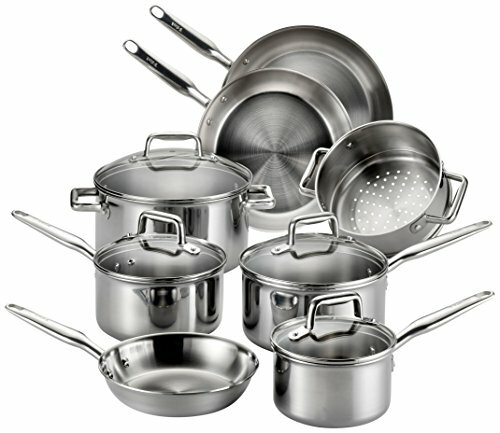 The cookware can be used on any stovetop, including gas, electric, ceramic glass, or induction, and it’s oven safe up to 500 degrees F. The cookware's stainless-steel handles offer a secure grip and come permanently attached with stainless-steel rivets and caps, while its tempered-glass lids make it easy to check on cooking foods at a glance and are oven safe up to 350 degrees F. Even more, gently flared rims allow for easy drip-free pouring, and a polished stainless-steel exterior gives the cookware a sleek sense of sophistication. To clean, place in the dishwasher or wash by hand in hot soapy water and dry thoroughly. As part of the Tri-Ply line of cookware, this 12-piece set offers an array of everyday essentials, including 8-inch, 10-inch, and 12-inch fry pans; 1.5-quart, 2.5-quart, and 3-quart saucepans with lids; a large 6-quart dutch oven with lid; and a 3-quart steamer insert. From quick weeknight meals to holiday entertaining—T-fal Tri-Ply cookware has you covered.